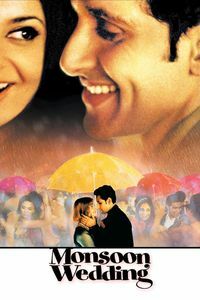 (In theaters, November 2002) This is an Indian film starring Indian actors in an Indian setting, but don’t mistake this for a Bollywood film: Monsoon Wedding is closer to the type of American drama designed for Oscar recognition than to a full-blown musical. It’s realistic, dramatic, contemporary and very successful: This tale of a family on the verge of all sorts of thing may take place during a wedding, but it’s neither much of a comedy nor an Indian version of My Big Fat Greek Wedding. Instead, we have a heart-wrenching study of child abuse, class differences, arranged marriages, celebrity affairs, parent-children friction, the westernization of traditional values and all sort of other not-so-fun stuff. The beauty of Monsoon Wedding is how well it works, from simple scenes (the return home of the hitherto-comic “wedding fixer” says a lot in only a few simple seconds) to difficult choices (family or friend: pick one). The mixture of English, Hindi and Punjabi is effective (with subtitles), illustrating today’s India in what feels to be a very naturalistic fashion. Fans of family dramas and foreign movies can rush to this one. Complex, ultimately uplifting and generally quite enjoyable, it’s good enough to impress even those who don’t usually go for these films.